What a good start to 2011! Alhamdulillah.. Dekya made a very good start of the Winter Term by winning another Congratulations certificate in just the 1st week of school term. 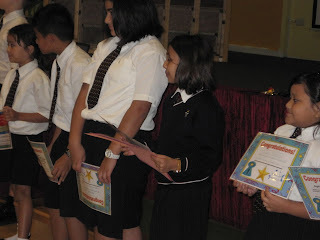 This time, Dekya's best friend Kieran Bell dapat Principal's Award. Quote from Dekya's Certificate : "CONGRATULATIONS Dira Shahreen for consistently producing work of a very high standard and being very caring towards her friends".. well done Dekya!. "This is me with my congratulations. I am proud of myself! I've got 2 congratulations..." said Dekya. Then the next surprise for Mama & Papa... Abang too got Congratulations Certificate. Abang had been envying Dekya since last term, and has been working hard himself to obtain one. Finally, at the second week of the school term, Abang got what he earned. 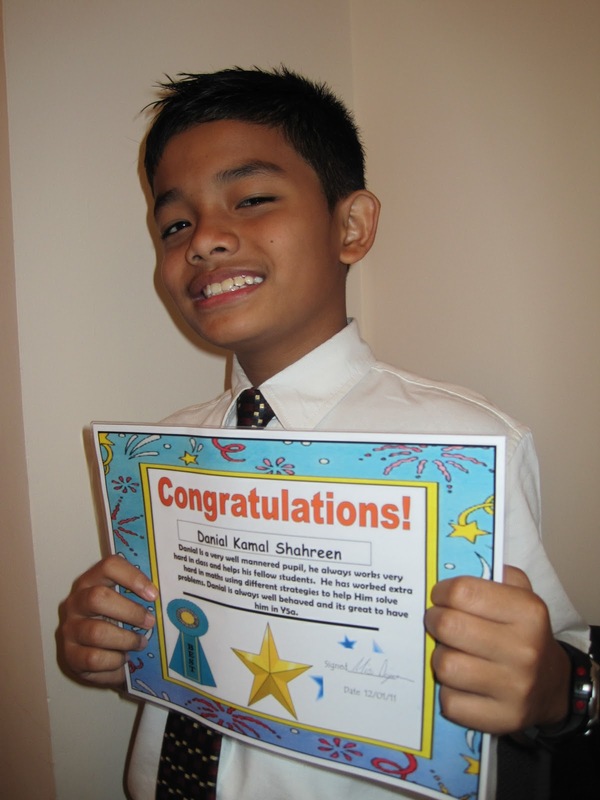 Quote from Abang's Certificate : "CONGRATULATIONS Danial Kamal Shahreen! 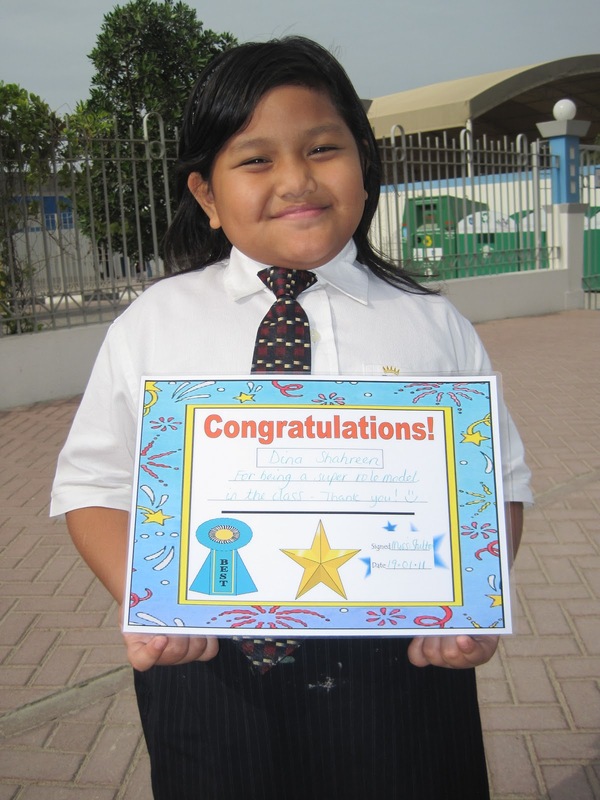 Danial is a very well mannered pupil, he always works very hard in class and helps his fellow students. He has worked extra hard in maths using different strategies to help him solve problems. Danial is always well behaved and its great to have him in Y5A".. Well done Abang!. I love getting congratulations award. ... said Abang (a.k.a Danial 10). Dede too had been eyeing the award. Mama asked Dede to work harder and pray to Allah. Finally, it came as a surprise too. Dede got her Congratulations award the same week as Abang, what a coincidence. 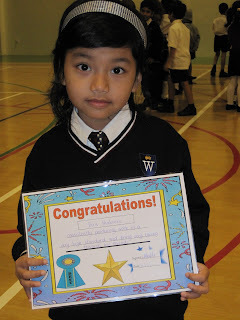 And alhamdulillah.. Quote from Dede's Certificate : "CONGRATULATIONS Dina Shahreen for being a super role model in the class, thank you! ".. well done Dede!